My friend Carolyn has been telling me about how good kale chips are. I kind of found it hard to believe. Kale? Really? Kale, if you don’t know, is one of those virtuous leafy greens that often confuse you in the supermarket: Is it chard? Is it kale? Is it collards? What do I do with it? And is it going to smell up my kitchen if I try it? Really, kale is simplicity itself to use. It’s the bumpy looking one with curly edges and a stem that is not very thick (chard’s stems are more noticeable and quite often red or yellow – as in rainbow chard). Rinse well, cut out the stem and cook it much the way you would spinach, just cook it a bit longer, as it is denser and tougher. I don’t use it raw. It is a cool weather crop, meaning that if you have a patch of dirt, you can grow it even in winter, which is a big plus if you are big into seasonal eating. Now Carolyn loves good food, so I knew she couldn’t be making it up, however odd kale chips sounded to me. And the more I thought about it, the more I considered the Asian seaweed strips I like so much. Wouldn’t it be similar? So I got myself a bunch of kale – about 8 oz, give or take — from Sang Lee out in the North Fork and gave it a try. Had to wrestle this from the table in order to get a shot of the shrapnel! The results were a revelation! The kale chips were crunchy and had a slight, but pleasant bitterness, tempered by the salt. My parents and John the Painter who happened to be doing some painting with my dad downstairs gave it a try – Leandro was not having it – and we made short work of the whole tray. In fact, my pictures are pretty thin on the actual kale because in my eagerness to try them, I forgot to take any photos until we had almost cleaned them out! I will be planting kale in the late summer and I will be making this all winter long for my late-night movie snack! Thank you Carolyn! What was left when I remembered to take a picture! Preheat oven to 350°F. Line a rimmed baking sheet with parchment paper. 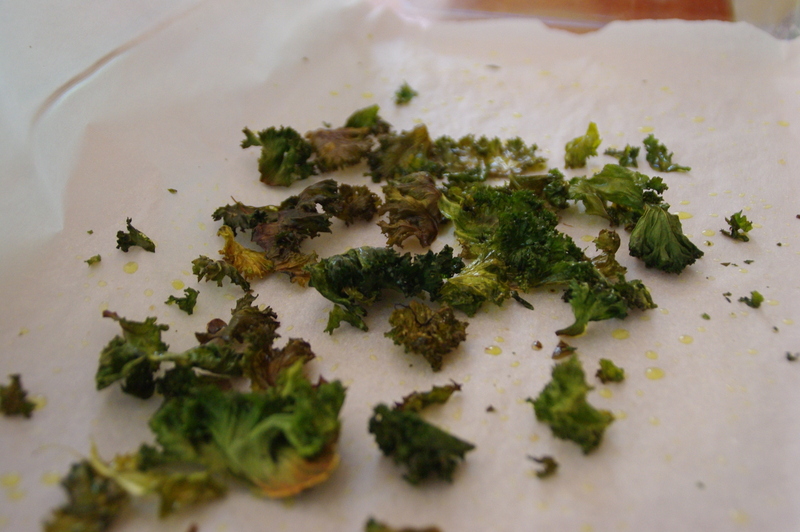 Lay kale pieces on parchment paper, leaving space between all of them – no touching! Drizzle with oil, and sprinkle with salt. Bake for 20-30 minutes, until leaves are crisp. Serve. ← Grilled Lemon Chicken – Bring on the Barbecue Season! 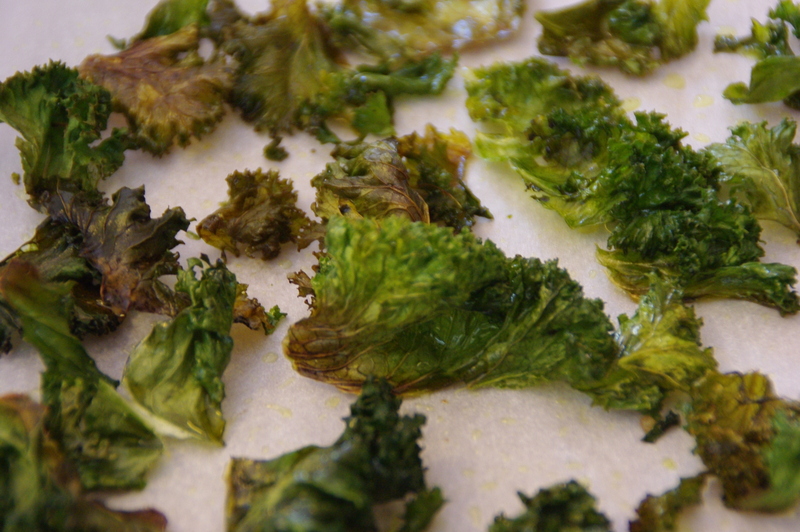 I can’t get enough of kale chips – I just wish I could figure out how to keep them for a day or so without them going soggy…. Thanks for the recipe! Thanks for the visit…so far we’ve never had enough to eat straight out of the oven…I think a double batch would just end up with us eating it all at once! Veautiful – I love chinese crispy “seaweed” so would adore this too! I think you would!!! Thanks for the visit! Love me some kale chips! I usually toss them in the olive oil, and when I’m feeling creative will use different spices like garlic powder or cajun spices. A little paprika also is good. Thanks for the visit John…that Cajun spice idea perked up these ears right away! Love these! Sounds goofy but I hadn’t really thought about doing them in the oven. I used the dehydrator. Oooh, high tech! Do you use the dehydrator for other things? Sounds really cool. Thanks for the visit! Yes, especially leeks and okra and making crackers. I make them all the time. Sometimes I will drizzle a touch of vinegar and sea salt on them. So tasty! What a good idea!!!! Thanks for the tip! I have been wanting to try these–now maybe I will give a try.. I hope you will! We loved them over here! Yes! Always frustrating when I make something good and forget to pull out the camera….